This immediately causes a problem though: Esdese is, apart from an ice manipulator, also quite an accomplished melee fighter. 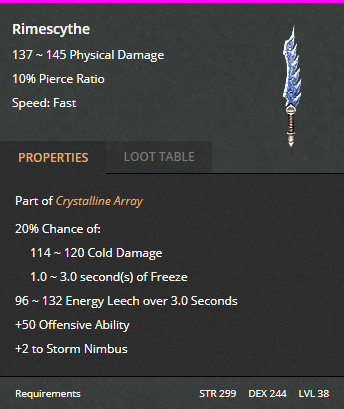 Giving her a physical damage melee weapon would also synergize extremely well with Freezing Blasts -100% physical resistance debuff on enemies. Yet, true hybrids simply don't work in TQ. Thus, the most obvious class choices such as a Thane or a Sorcerer can be forgotten about. We simply can't invest the stat- and skillpoints to make dual-wielding or piercing damage worthwile. Also, a Paladin isn't really an option, because a buff shield carrying character is the last thing we want. The easiest would be to just give up the melee aspect, and go for an Oracle. 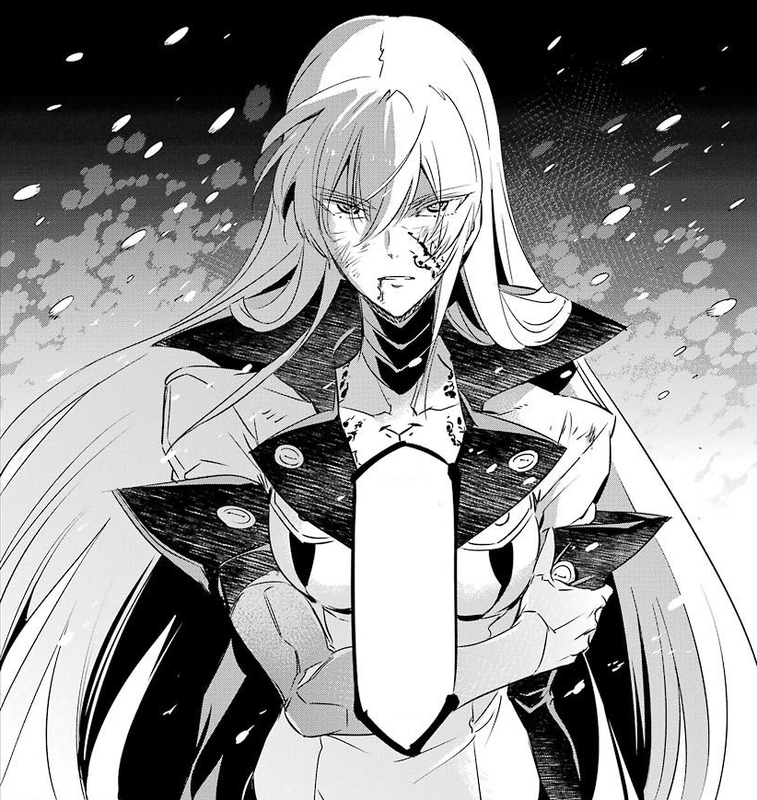 ask Leone; Deathchill aura seems just so befitting, and there'd even be points to spare for Enslave Spirit or Dark Convenant with Unearthly Power, muahahahaha,..
A Thunderer appears to provide a very interesting alternative though. 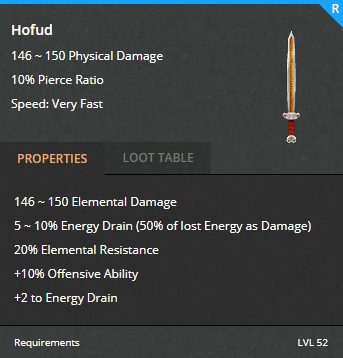 Rune Weapon allows us to get closer to a true hybrid character than any other skill ingame, and Runeword: Feather allows us to equip weapons we otherwise would have had the statpoints to invest in for. It's a bit deceitfull though, since we'd still not be doing much actual physical damage, and that taken into consideration Freezing Blast's debuff would remain only marginally effective, unless ofcourse we're playing co-op (yeah, someone else can start a thread about a Tatsumi build then), in which case the whole physical requirement argument becomes mute and we could pick pretty much any secondary, which would most likely end up being Spirit. Anyway, Sacred Rage with Frightining Power sound at least as good as Deathchill Aura. Finally, we might actually have to rethink Thane. Take some points out of Battle Rage, Onslaught, and some of the dual wielding procs, and skillpoint-wise it'd be doable. That way we're sure we won't be temped to equip a shield (any other melee character will, because the off-hand remains free otherwise). Statpoint-wise I just can't figure this one out though. Full Int. is the way to go, and would work for damage, but we wouldn't be able to equip any half decent weapons. What do you guys think? Oracle, Thunderer, Thane, or something else alltogether? Yet, true hybrids simply don't work in TQ. Yes, I agree, but I think things are getting a bit mixed up here. A sharder should not be a hybrid. Basically we're going for a warrior look, by holding one or two swords, and maybe occasionally smashing some ice, but essentially it's a unadulterated caster. Hybrids are very much possible if you go for elemental damage instead of physical with the new rune mastery. I don't know how "in character" that would be in your case, however. 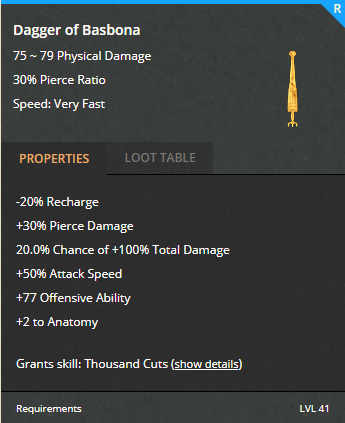 If your melee damage has to be physical you really will have to create a jack of all trades (i.e. invest in both int and str instead of one over the other) which overall weakens your character. Hybrids are very much possible if you go for elemental damage instead of physical. Yes, I have a "hybrid" bow Sage that way, but it's not a true hybrid. I think you're right in that an elemental damage Rune build is the way to go, but unfortunately I said it won't take advantage of Freezing Blast -100% physical debuff. However, building a sharder that does capitalize on that is just not feasible. It would indeed end up as a weakened Jack of All Trades character. That's cool, I had not heard of that build yet. Two times Persephone's Caress won't work though "in character". What I'd like to know about is that Pre-Ragnarok Thane Sharder mentioned, as I'm not familiar with that build either. Biggest surprise though, was that Rune by itself enables dual-wielding. I did NOT know that. Is it Reckless Offense that enables it? That pretty much settles Thunderer as the class of choice for this theme. Port in due time will be much appreciated. In fact, the whole Crystalline Array set seems great (even though Rimescythe by itself is not thát great), which would just leave one more weapon or shield slot to fill, plus jewelry. It buffs precisely the skills we're not using, it add skills from Storm mastery we don't have the point for to commit to in ourselves, it reduces requirements, it regenerates energy, and it provides some much needed defense, not just as armour, but also by reflecting damage, and debuffing enemies. Squall is another skill we otherwise can't really commit to, and the +44 Str. is really nice. They aren't really good, but they have no stat requirements, other than level. 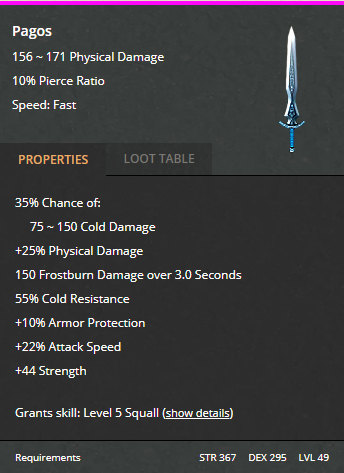 Out of these the Dagger of Bashona is by far the most interesting, because of the recharge and +100% Total Damage. Since most of our damage will be coming from elemental additions, the latter might actually matter much more than the Bashona's rather mediocre base damage. Finally, I completely forgot about throwing weapons. Personally, I have absolutely zero experience with them, so I just don't know, but maybe they'd work, but since a lot of them are short blades, they would definitely work character wise. Hmmm,.. I was thinking about Pagos, more because of the other stats and Str. bonus, and Rimescythe because of the overall set bonusses. You're right though that shard damage will be lower, though this should be slightly offset by high elemental melee potential. Started on this build. Going for these skills at level 75. The reason for this distribution is that, with Runeword: Feather, it allows you to equip both of Persephone's Caress and Pagos, without need for -%req. gear. 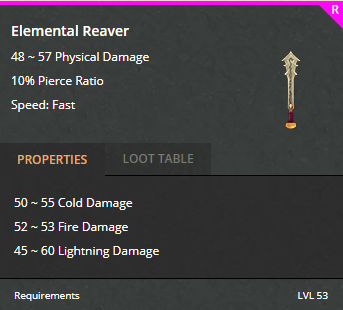 That doesn't mean either of these two weapons are required for this build, but together they seem to provide a solid point of aim for attribute point distribution. As @botebote77 allready pointed out, you could do with less Str. and Dex., if you avoid using swords, and get +skills for Runeword: Feather.